Amongst the many internationally-renowned luxury hotels that dot Jalan Bukit Bintang, a new member has appeared to join its ranks. 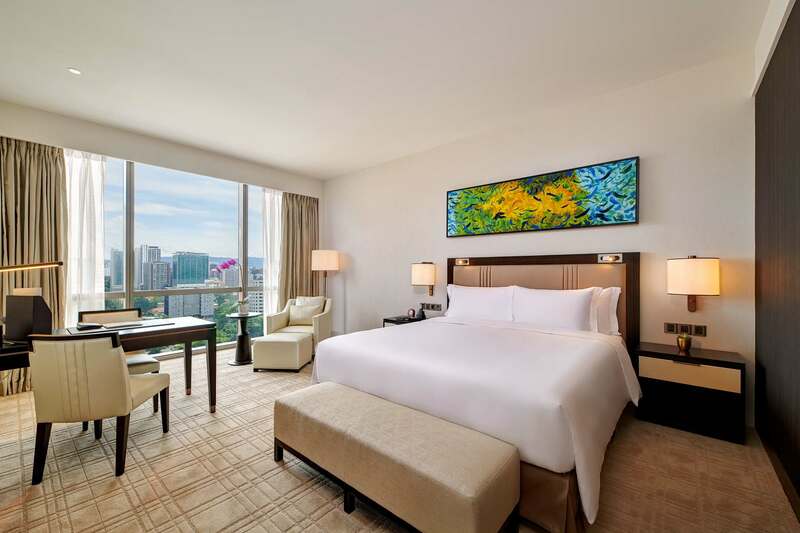 Pavilion Hotel Kuala Lumpur Managed by Banyan Tree is the latest addition set to challenge the market of business hotels in the area. 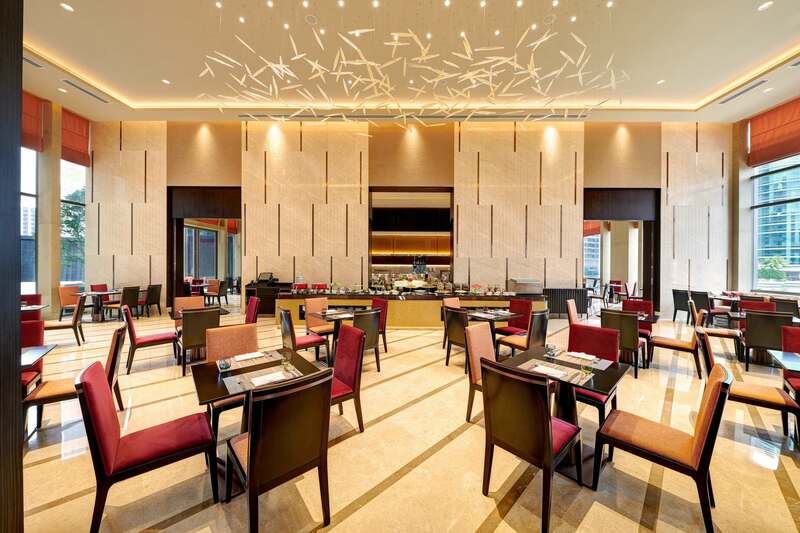 While its bigger sister Banyan Tree Kuala Lumpur is just across the street, Pavilion Hotel KL appeals to a completely different clientele who seeks to be within the hustle and bustle of the city. It just opened its doors in December 2018 and we stayed a night to check it out. The Pavilion Hotel KL entrance. 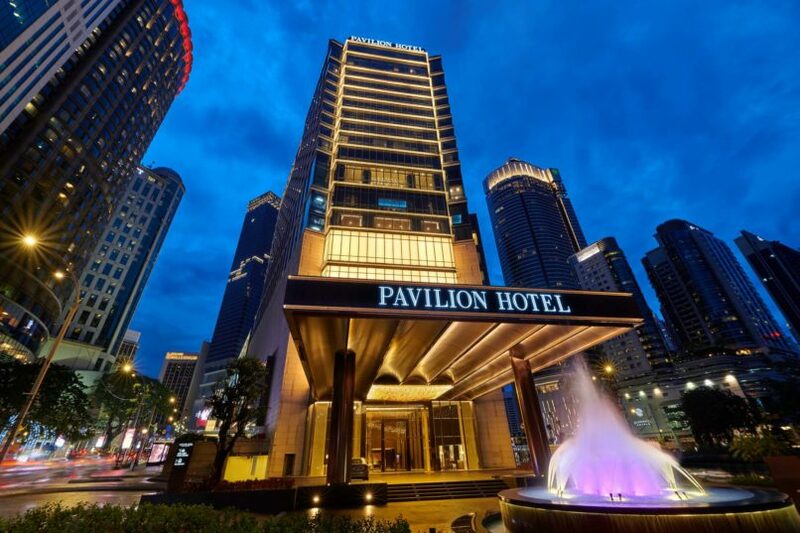 This is where the Pavilion Hotel KL’s location truly shines. It is directly connected to the Pavilion KL shopping mall right smack in Bukit Bintang. This means you are at the most accessible location to many other attractions, including Suria KLCC, Brasserie Fritz, and a whole slew of other bars in the KL city centre. You will also literally be steps away from the only Lush outlet in Malaysia, which you will need to visit to get a bath bomb for the tub in your room. If you love being in the thick of the city hustle, then this location is perfect for you. The Urban Studio overlooks the city. 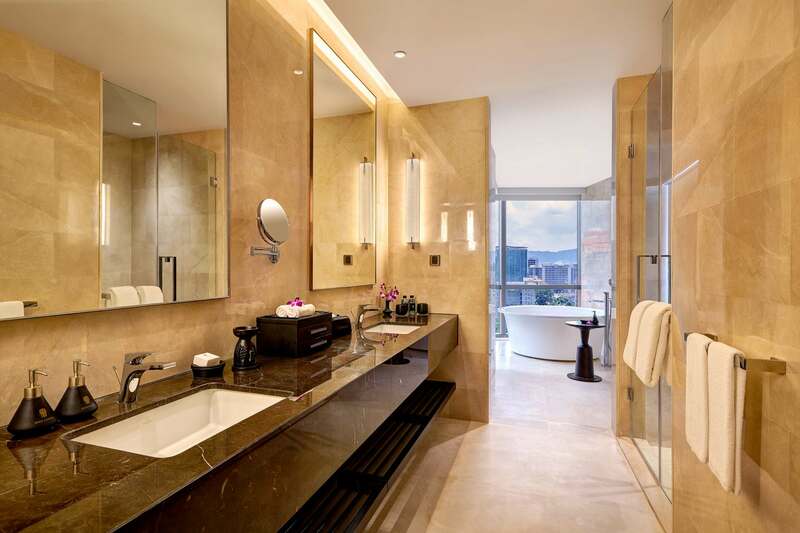 The expansive bathroom of the Urban Studio room. The Urban Suite living area. 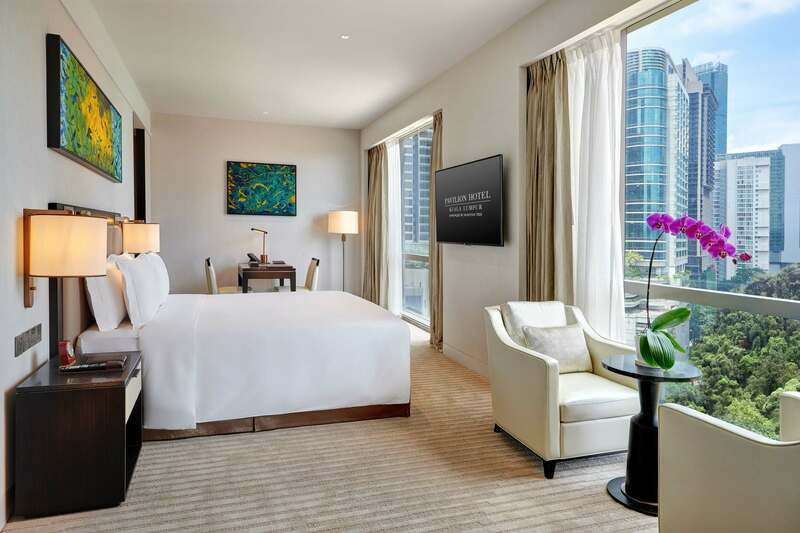 325 rooms are spread out across the 13 floors of guest rooms in Pavilion Hotel KL, and it encompasses the City Oasis, Courtyard Oasis, Grand Oasis, Club City Oasis, Club Grand Oasis, and Urban Studio room types. We spent the night in the Grand Oasis room, a contemporarily-designed space that looks out to the city below. 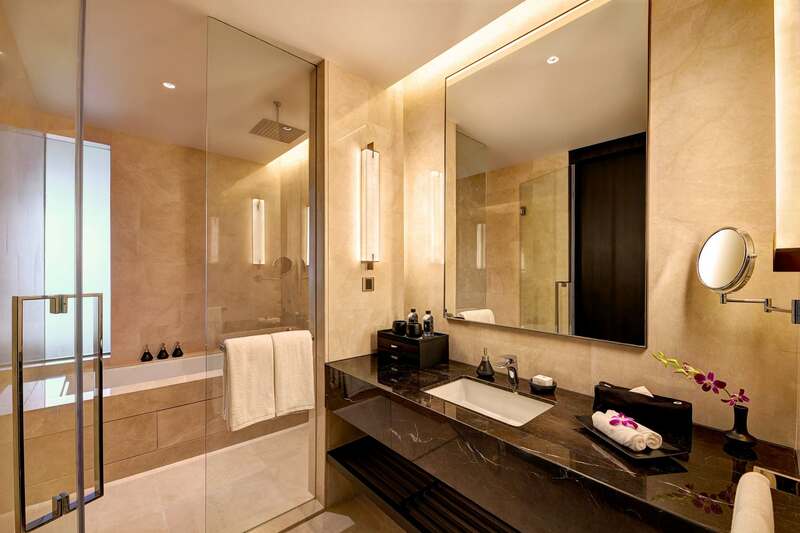 At 42-60 square-metres, the room is spacious enough and also comes with a bathtub to soak your stresses away. Naturally, the bathroom is stocked with Banyan Tree bath products that will make you feel like you’re already in their spa. Upgrade to the Urban Studio and you’ll be able to lounge in the freestanding bathtub that overlooks the city centre. Now that’s a view you’d want to have. If you’re wary about being kept up at night due to the traffic noises within the city, fret not. The room is well padded and soundproofed that you won’t be able to hear a peep. 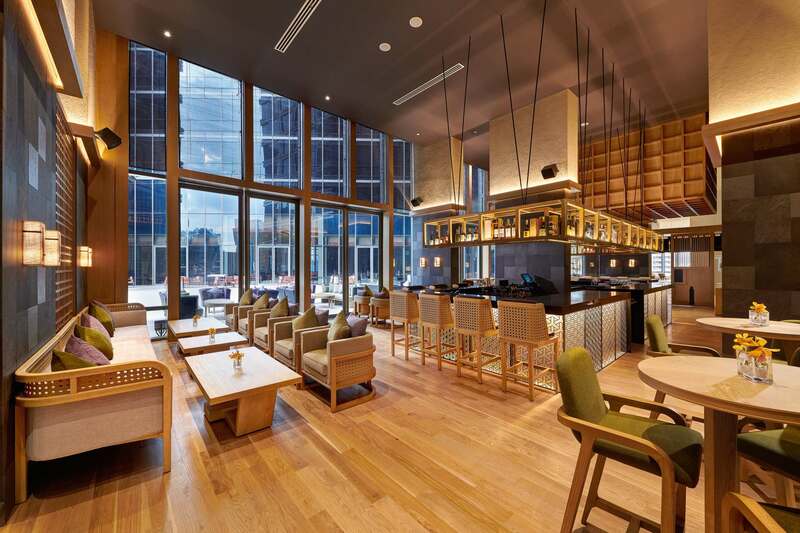 There are currently two dining outlets within the hotel: The Courtyard and Ebisu. The Courtyard is the hotel’s all-day dining area which serves up your standard continental buffet variety during breakfast and lunch. As its name suggests, there is an al fresco dining area in the courtyard of Pavilion Hotel KL just in case you’d like a different scene. With a cascading man-made waterfall in the area and the tall buildings enveloping the courtyard area, we actually forgot that we were still in the city centre. Alternatively, eligible guests — who booked club rooms or suites — may have their buffet breakfast in the privacy of the Club Lounge instead of The Courtyard. Ebisu is the other dining outlet, serving up a smattering of your favourite Japanese fares from sashimi to lightly battered tempura. Chef Kusuo Kamiishi — also known as Chef Ricky — heads the team in Ebisu. We recommend trying their signature offerings of Ten Don (a compilation of seafood and vegetables deep fried in a light batter) and the Sirloin, comprising black Angus sirloin cuts drizzled with the chef’s special teppanyaki sauce. To wrap up our night, we headed over to Pavilion Hotel KL’s in-house bar, Whisky Cove. This little sanctuary for whisky enthusiasts is packed with a wide array of labels from over six whisky-producing regions. 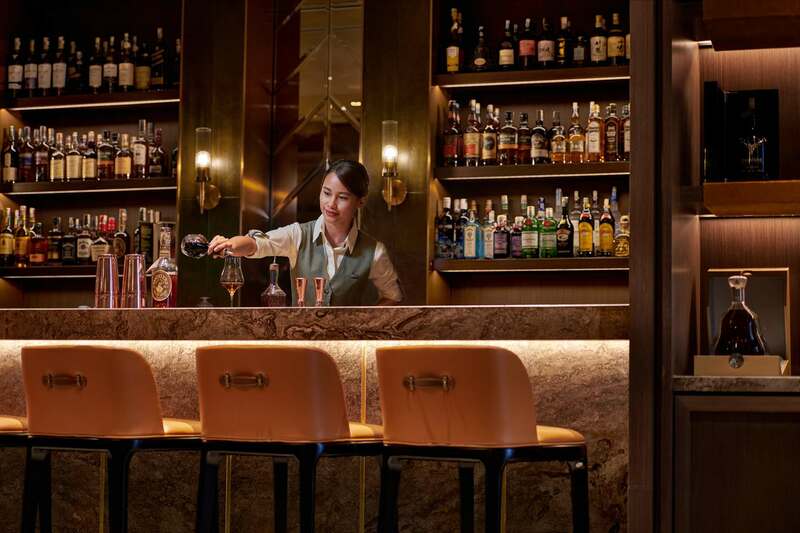 Sit by the bar and watch the bartender fix your drink, or book one of the several private rooms in the outlet. If you’re not feeling for a glass of whisky on the rocks, you can also request for the bartender to shake up a cocktail too. Guests who have access to the Club Lounge are able to enjoy its amenities, including cocktail evenings, refreshments, and the Club Lounge Meeting Room. But our eyes were set on the Banyan Tree Spa Pavilion Hotel Kuala Lumpur. 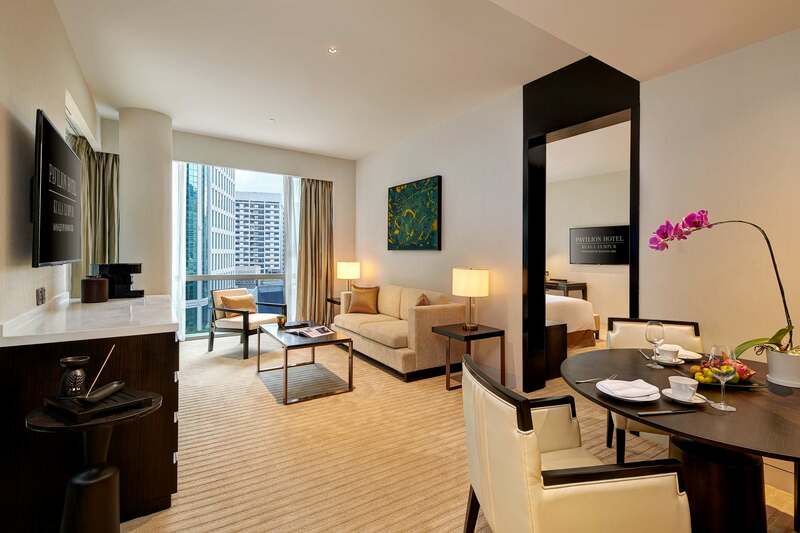 While there is also a Banyan Tree Spa across the road at the Banyan Tree Hotel KL, this particular one emphasises on having couple-treatment rooms. Of course, if you’re alone, you can have the room all to yourself too. The spa boasts Banyan Tree’s signature Asian healing therapies, as well as a soon-to-come rain mist therapy room that not even the Banyan Tree Hotel KL’s spa has. 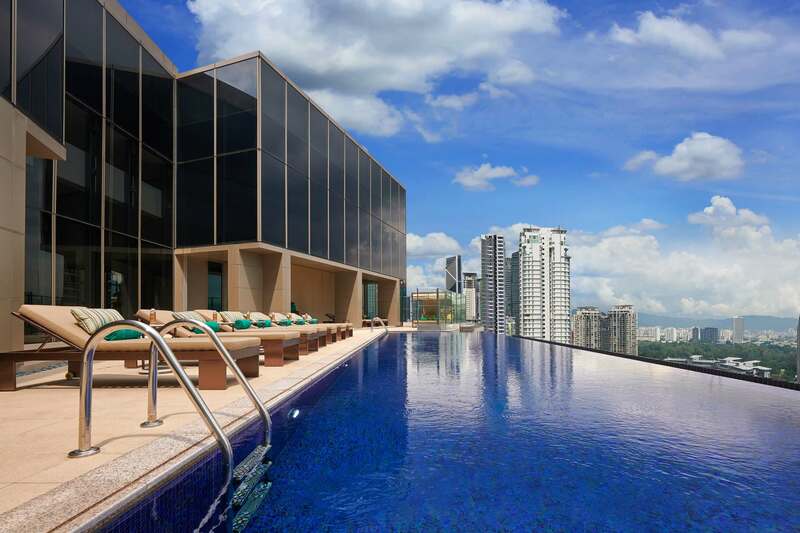 For the best spot to capture Instagram shots, head up to the rooftop and check out the hotel’s rooftop infinity pool. Located on the 18th floor, the pool offers unparalleled views of the city’s skyline, which you can savour with a drink in hand. 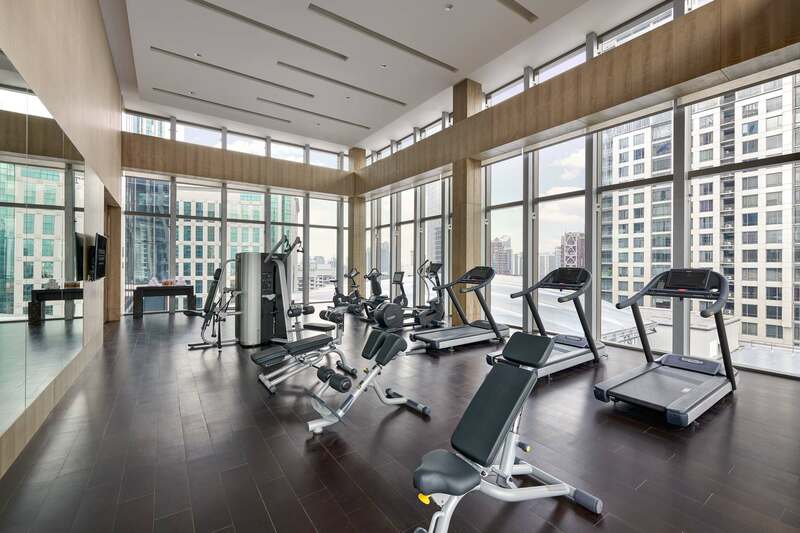 On the same floor is the 24-hour Sky Gym, where you can work out to a great view of the city. Pavilion Hotel Kuala Lumpur Managed by Banyan Tree wins the most brownie points for being in the middle of the city and having direct access to the Pavilion KL shopping mall. But more than convenience, it is the perfect escape the minute you step onto the eighth-floor lobby. 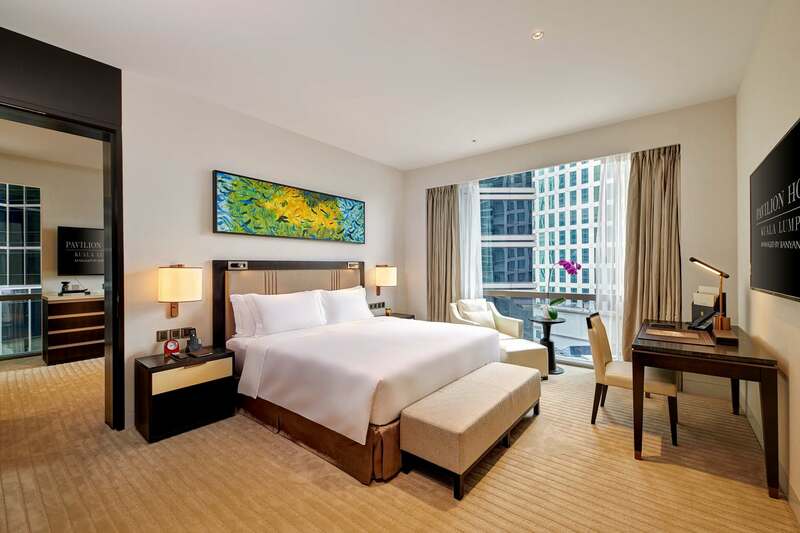 All the hustle of the city fades away and you are in the oasis that is Pavilion Hotel KL.